Masterful instrumentals, unexpected gorgeous natural sound effects and lyrics of traditional songs sung beautifully by Lisa Winn are all wrapped up in a lovely package that includes heartfelt liner notes. 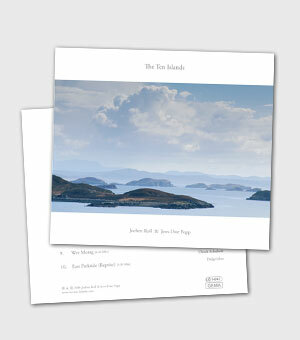 The Ten Islands is a lovely album to keep one company settled in one's sanctuary on any day of the year. The 10-track album includes Scottish tunes such as "Mairi bhan og," pieces by Nigel Gatherer and one song by Jim McLean. Jochen Ross and Jens-Uwe Popp make the tunes their own with their expert string techniques on mandolin and guitar. Other artists on instruments including the didgeridoo, percussion, double bass, etc., add layers to these rich, creative arrangements. It was clever to offer two arrangements with different tempos for "East Parkside" to allow listeners an opportunity to compare and contrast the artists' offering. These two German musicologists are world music stars, and this album is a success.